The weekend before Thanksgiving, I headed partway across the state to Rochester, NY to attend my annual state NYSATA convention. This post is an overview with a few highlights, and some thoughts on state conventions. My next post(s) will cover the details of workshops that I taught and attended. Here's a view out my Rochester hotel window of a couple of funky buildings in the early morning sunlight. My car was packed full, because I was teaching 4 workshops (two of them hands-on), and as an exec in my region, I was also responsible for bringing the supplies for a couple of activities at the conference. And of course my suitcase had to fit in the car, too! One of those special activities is my brain-child, the "Bling Your Badge" table. This is our third year with the table, and it is a favorite activity of many convention attendees throughout the conference. Glue guns are plugged in for use all day, and we provide a wonderful selection of materials, including 'jewels', pipe cleaners, ribbons, sequins, buttons, wiggle-eyes, funky felt, and so much more. As a matter of fact, I had to remind a few people that we should be able to see your NAME on your tag! They got so carried away adding embellishment that their names were buried! I'm so proud that this fun table is my idea. Our convention usually has around 500-600 attendees. I'm not sure how many there were this year. But anyhow, because of the size, we usually hold the convention at a hotel/conference center sort of place. In my earlier years of teaching, NYSATA conventions were held at Catskill hotels (kind of like the place pictured in the movie Dirty Dancing). We were a "captive audience" in these hotels, so everyone attended all the meal events and and any evening activities. There was simply nowhere else to go. But as these hotels got older and seedier, we eventually stopped going to them, and moved the convention to various locations in the state, usually in areas like Rochester or Albany, which are a more urban environment. We hold dinner/award events at the convention center/hotel on Friday and Saturday evening, and an award brunch/luncheon on Sunday, but unfortunately, not all conference attendees choose to participate, many instead electing to find a less expensive meal elsewhere. I'm curious how you combat this problem in your state. It means a loss of a certain sense of community for those people who don't attend. But, since many pay for their own meals, it is a choice made out of financial frugality, and I would love a solution that would get all conference participants to attend. This year, at the Friday night dinner, I was awarded a Special Citation award. Since I retired, I have represented our region at the state level, and have taken on a lot of regional responsibility. So I was/am proud to be recognized with this award. Unfortunately, before I was notified of the award, I had already signed on to present a "Friday After Dark" hands-on workshop, which meant that instead of celebrating, I was teaching! (No cocktails!) Many of my fellow region members did not attend the dinner, because they chose to eat elsewhere at less cost. So again, I'm curious how meals and awards are handled at your state. By the way, I'm dressed in black because I knew we'd be using India ink in my workshop! After our Saturday night award dinner, we always hold a special event in conjuntion with a DJ and dancing and a bar. We've held TASK parties, a scavenger hunt, and this year there was our first "Partici-Paint" activity! Each activity was asked to bring the needed materials to create something that could be auctioned off for the NYSATA Scholarship Fund. Our region chose to paint four mirrors with seasonal themes. I painted autumn, and there's Kathleen showing off the spring mirror! Here's autumn and winter shown together. Other regions chose various projects; two of my favorites were Sharpie doodled stools (below left) and a lovely bench, which was purchased by the gal in my region who painted the lovely winter mirror. Of course, we also have a vendor area at the convention. It seemed like there were a few less vendors this year, though it might just be a matter of perception, since we all agreed that the vendors did not offer their typical bounty of giveaways at their booths. Usually I come home with a bag full of funky markers and paintbrushes and Cloud Clay or Model Magic samples and more. This year... no. I wonder if they will still be giving out samples at the NAEA convention this spring? Blick did supply it's usual little sketchbook in a zipper pouch, and there were a few other odds and ends here and there, but basically, not much. I think the exception was Chroma, who gave away loads of little sample bottles of paint, and when they closed up their booth, gave away all their big bottles of paint! As a matter of fact, before one of my workshops, I discovered that the white acrylic I would be using seemed spoiled. I asked Chroma if any of their small sample bottles contained white, and instead they supplied me with a large bottle of heavily pigmented white acrylic. 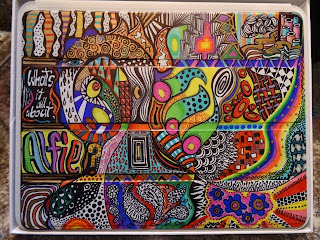 Fabulous paint; thank you Chroma! In a day or two I'll tell you about the rest of the conference - especially workshops I taught and attended. In the meantime, I hope to hear more about yours! Sharpie shoes! Doodles for my feet! I've had these ankle boots for a year, but I also have a pair of black clogs, and a pair of black knee-high boots, so these boots were sort of redundant. They are very comfy, but I thought they were were kind of blah, so they deserved a makeover. I bought oil-based silver Sharpie paint markers, and tonight, while watching some brainless TV, I went to town on the boots. I'm looking forward to wearing them! I have no idea how the Sharpie will hold up if/when I wear them in rainy or snowy weather. Hopefully, OK? Last summer, I did this to a pair of ugly but comfy orthopedic sandals, with a white Sharpie oil-based paint marker. I think it really helped. Now I actually WANT to wear them instead of hiding their hideousness in the closest! 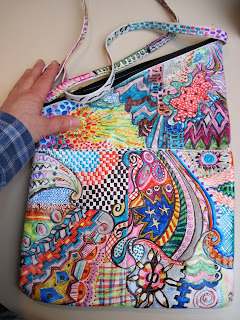 I've doodled on other stuff, such as this purse below, with regular Sharpies. The purse is several years old, and the Sharpie has held up well. I have a black purse I'm bored with. Maybe it will get the silver Sharpie treatment next. But it has a gold clasps, so maybe I'll use silver AND gold, so it will go with more. And then there's iPad covers. This one below was my first iPad. And this is my current iPad cover, done with black, white, silver, gold, and bronze Sharpies. And this one was a gift for an old friend. I've decorated bowling shoes with Sharpies, both for me and a colleague. 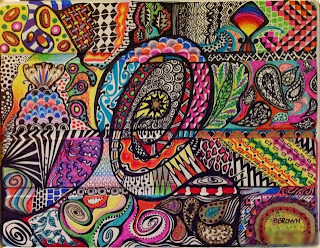 Thank goodness I doodle a LOT better than I bowl. I may roll lots of gutter balls, but hey, at least my feet are gonna look good! I decorated the bowling shoes probably 8 years or so ago; it took me until this summer to realize that I could doodle on other shoes, too. I apologize, faithful readers. I haven't posted in a while. My DragonWing Arts art enrichment business went on unplanned hiatus this fall, when my former students suddenly had too many conflicts, and I had only one enrollment for a planned fun fall program. With no students, I haven't had much I've wanted to post. I am disappointed, but hopefully my business will improve. But nevertheless, I've kept really busy. I love the fall, and have been outside whenever possible. The top two photos are from a walk on the bike path along a canal, not far from my home. We've been back and forth to Cape Cod to see my brother's new home, and to Boston to see my son's new apartment (the two photos above are from the drive home), and I've been raking leaves, and last week, on a couple of lovely fall days, we spent a little time at our camp where I kayaked alone on a totally empty lake. (Empty of boats and people, that is. There was a pair of loons on the lake.) The autumn colors may be gone, but the quiet lake is still beautiful. Meanwhile - a few days ago, I went to the driveway to get into my car, and looking across at the neighbor's driveway and the pile of raked leaves at the end of it, I saw this cutie below. I haven't just been 'playing' outside. I've also been prepping madly for the coming weekend, when I head to Rochester for our annual state convention. My art studio is a total disaster, filled with boxes holding the supplies and handouts for the four workshops I'll be teaching, and materials for the "Bling Your Badge" table that I'm in charge of, and supplies for the Saturday night Partici-Paint activity. All of this means, of course, that I should have lots of artsy stuff to tell you about when I return at the end of the weekend! See you then! State conference season - your input requested!